When Your Kid Won't Stop Biting originally appeared on Babble.com. Jean had heard the sound before -- a high-pitched shriek, like something you'd hear in a horror movie. She had just arrived at the childcare center to pick up her 2-year-old son Griffin, and he was letting loose at full volume in the other room. That kind of shrieking usually meant that Griffin wasn't getting what he wanted. Upon entering the room, Jean saw the teacher clutching Griffin tightly in her lap as she firmly held his hands down. Griffin's face was flushed and tears streamed down his cheeks. The teacher explained to Jean that Griffin had once again hit another child and bit her on the arm. Why? He wanted a single red crayon she was using to color her picture. Related: Does your child have an anxiety disorder? The teacher's message to Jean was clear: Either Griffin needed to find a different way to express his needs and wants or he would not be allowed to return to the daycare. Jean was distraught. This wasn't the first time she had seen this behavior from Griffin but she wasn't sure what else to do. She had tried ignoring it, and even putting him in time-out, but it didn't seem to change his behavior. It was becoming more intense and more frequent, and now it was happening at daycare as well. How was it, Jean asked herself, that this once mellow child had become so aggressive? Your toddler is watching you closely and your behavior is important. When parents yell, a toddler is likely to become more anxious or upset. Keep it simple and be direct as you address the behavior, and tell your child why it needs to stop. For example, you might say, "Do not bite. Biting hurts." 2. Focus on what your toddler is trying to tell you. Toddlers will work pretty hard to get what they want. Unfortunately, they don't always have the vocabulary to express themselves and use actions instead. 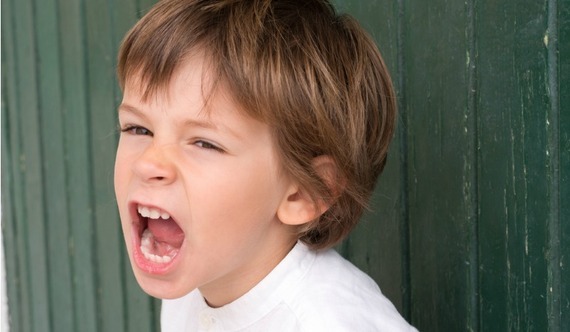 When children act out, parents are tempted to punish them. Focus on teaching your child a replacement behavior to use instead. For example, if your son hits a playmate to gain control of a toy, you can respond by giving him a hug and explaining, "Hitting makes your friend frightened. Let's figure out how we can share the toys." Related: The hell that is known as "the terrible twos"
3. Work together to teach new behaviors. For example, a child might want an extra cookie at snack time - - but his reaction to being told 'No!' may be to yell at you. Next time, sit with your child during snack time and explain that you'll each be having just one cookie because it will soon be lunch time. Offer your child a reward if he reacts calmly to this news. "If you eat your cookie quietly, we can read your favorite book together after snack." Consistent positive reinforcement usually works well. 4. Find out what support your school district offers. Some districts have programs to help young children who are experiencing challenging behaviors that aren't responding to parent interventions. Ask about Early Learning Services or Early Childhood Family Education classes that help children develop socially, physically, emotionally and intellectually. 5. Talk to your pediatrician. Do you have a 'testy' toddler in your home? Your experiences in dealing with challenging behaviors in early childhood could be helpful to other parents who are concerned about their child's behavior. Please share your thoughts and experiences!